We started our day with breakfast at the Cracker Barrel. They love old stuff there. Not usually my tast, but they had an interesting vending machine on display that caught my eye. Because there were no storms to chase, we had a down day. But it was a really nice one. We drove to New Mexico to see a vulcano and the beautiful view. The view from the hill was amazing, partly because we could see a thunderstorm and rain curtains in the distance. With my lighting app I was able to capture one strike in the distance. After a while another storm got close to the hill and it wasn’t safe anymore. Down the hill our van broke down, something to do with the cooler water I understood. We waited for a bit and then <insert the A team music here> Charles temporarily fixed it with ducttape so we could go to our motel. And big surprise… another Motel 6, number 5 if I’m not mistaken. Maybe today was a good day to buy a lottery ticket, or maybe I used up all my luck for that day, but I was really happy. 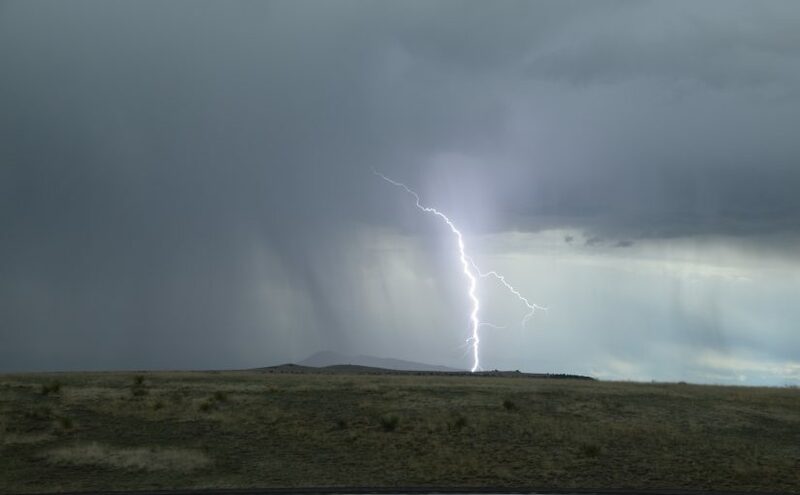 As we drove by the thunderstorm, I caught a lightning strike on camera. Dinner was also in Raton, New Mexico, at the K-Bob. Previous Previous post: Here comes the sun!